You are here: Home > Topics > Power Tools, Pneumatic Tools, Hand Tools and All Things Tools > Power Sanders > A Cordless Belt Sander! This topic contains 46 replies, has 20 voices, and was last updated by WoodsConstruction 2 years, 3 months ago. I would love to get both a cordless belt sander and trim router that they have. I really don’t want to get into the ridgid cordless line however. If a red one comes along I will get it. Thanks for showing us information / link. It’s a great review. I still have to watch the videos tho. Ridgid is starting to up their game with cordless tools. I really like the looks of the sander and the reviews have been promising. After watching the review I’m impressed. This and the cordless router need to be in my shop. Ridgid has stepped up their game. Not a tool that would be top of my list but I can see how handy it could be for some jobs. I could use one for scribing, for sure. How readily available are 3 x 18 belts? That is a size I have not encountered before.. But really scribing cabinet work its still the use. this is awesome, i’ve been eyeing sanders recently and belt sanders have seem to fallen by the wayside but with ridgids 18v one, i hope they are making a comeback, i could definitely use one. Yes the old 504 sanders were the best made in my option. I like the idea of a cordless belt sander. I think it looks pretty nice. @austin I agree 100% it would be great to have along with their cordless trim router. They would make a great pair, aside from needing another platform. I think a cordless orbital 5″ sander would be much better. I think Makita used to have one, but I don’t know if they still make it. Having all of the trim tools available in cordless would be pretty sweet. The power demands are not quite as great as they are for framing, and it is really easy to have chargers set up there too. Wow it does look like Ridgid is upping there game. 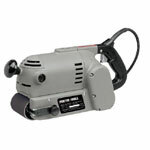 The belt sander does look like a nice handy tool with no cord. I don’t think I will buy one as I have a corded belt sander that I hardly use. But I am with @warren6810 that cordless orbital 5″ sander would be much better. I will be keeping my eyes on what Ridgid brings out in the future. I only own a Ridgid router that works good.